The Saltzman Youth Panel 2018-2019 is off to an amazing start! We are already on pace to have a great year and make a huge impact in our Jewish Community. In our first meeting we had the chance to not only learn about each other, but also about the exciting challenges and decisions we will encounter together this year. I was surprised by the size and diversity of the group of Panelists I met at the first session. The fact that we have such a large group is great because the more opinions and perspectives we have the better outcome we will get. In addition, I got to meet other Jewish high school students from around the community. During the first session we talked about our values and how they relate to philanthropy. I especially enjoyed our first activity: we each had the chance to think about and share our thoughts around the question “If I had one million dollars where would I donate it?” I thought it was very interesting how many different answers people gave to this question. We all have generally the same Jewish values, but we all have different ideas of causes we want to support. This is really great for our panel because we will bring many different ideas to each meeting. These differences are very important because it will allow us to pick the best organizations to give money to. My takeaway from this experience was that even if everyone has the same values or religion, we can still have drastically different opinions on different topics. Following our first session we all had the opportunity to participate in Super Sunday – the largest an annual community fundraising event held by the Federation to support the Campaign for Jewish Needs. Going to Super Sunday really pushed me out of my comfort zone. I had never called individuals I didn’t know to ask them to donate. It was a very eye opening and important experience because you grow the most when you are pushed out of your comfort zone. It's also very hard to ask people to donate money to a cause. We all had to be very enthusiastic when talking to get them to actually donate which isn't easy. Overall it was a great experience. I am very excited to be participating in such a positive program for our community and can’t wait to continue this journey during the rest of the year. Danny Ecker (second from left) with fellow Saltzman Youth Panelists. 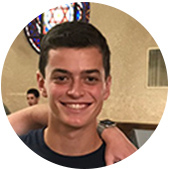 Danny Ecker is a junior at Hawken School. He is a member of Park Synagogue and an Israel.Cleveland.Next (icnext) participant. Danny is the captain of his high school soccer team and a member of Hawken's Student-Teacher Senate.